It goes without saying that Frye’s encyclopedic range of interest in and knowledge of the variety of art forms that make up a society’s imaginative culture is remarkable, unmatched by anyone I can think of. A good example is his essay “Literature and the Visual Arts” in CW 18, originally published in Myth and Metaphor. Frye’s wife Helen, of course, had a blossoming career as an art historian before Frye became a going concern and all hell broke loose; doubtless her interests, and of course his interest in Blake, helped to awaken his own affinity for the visual arts. It is worth mentioning that the Art Gallery of Ontario is hosting an exhibit of Chagall’s work (and some Kandinsky), October to January. You can check it out here. The AGO, by the way, has had a great new face lift, and is really worth visiting. I caught the New York Abstract/Expressionism (Pollock et al) this spring, and it was a real treat. The new CEO of the gallery, Matthew Teitelbaum, seems to have a magic touch. This entry was posted in Anniversaries, Painting on July 7, 2011 by Joseph Adamson. 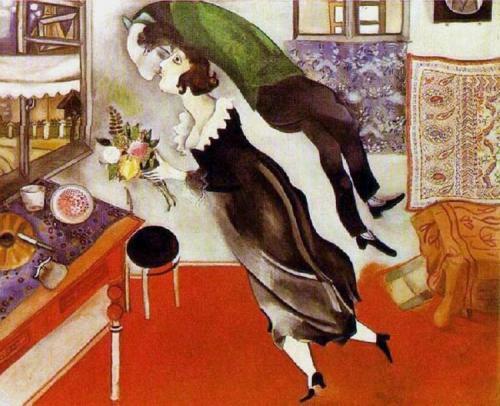 Today is Marc Chagall‘s birthday (1887-1985). Maybe one of the gentlest people ever to be a great artist, who was rewarded with an extraordinarily long life. This entry was posted in Birthdays, Canadian Forum, Painting on July 7, 2011 by Michael Happy.